It’s a busy week with Valentines, Mardi Gras, Olympics and Chinese New Year. . I wish I could take the time to cook food and celebrate all of these things at once, but alas, for me, for us, it’s mostly a Valentine’s celebration. Unlike most food bloggers, I will not be cooking. We are a couple that works mostly like this: She cooks; He cleans the kitchen. I know what you’re thinking. I must be lucky and you might say “most men would never do that.” I just don’t think like this. I believe people will do a lot to keep the good food coming. But, just for fun, I did a little baking, and I even cleaned it all up. The ONE THING my husband has mastered in the kitchen far above me is the cappuccino, and soon, he will do a guest post. He serves me the very best, perfected cap every morning. To show my appreciation, I baked these adorable cake cups to resemble his cappuccino. They are topped with cake pops. Jaden of Steamy Kitchen had the cutest post on cake pops with a video this past week. She admits being late to this “pop” party that was so big a year ago, but I’m glad she did the post and it inspired me to give it a try. Her pops are gorgeous, so do take a look. These are heart shaped, dipped in chocolate. To explain why my husband doesn’t do any baking in our house, I asked him to get red food coloring and he came home with the red decorative squiggles you see on the pops. It was a good laugh. I have real issues with red velvet cake. I’ve made it four times in the past two weeks and I can’t get happy with any recipe. It’s either too dense, not red enough, dry etc. I am still fighting the red food color thing, but substitutes worked poorly. I wanted red beets to work. In my mind, they should work, but I ended up with a great tasting light cocoa cake, but not the right color. So I made a box cake just to see what an artificially processed cake would look and taste like. Argh…it was good. That’s not good news for Spinach Tiger. I don’t do boxes and if I can’t make a scratch cake better than a box cake, something is wrong with me. Cake number four had the right color, but not the right texture. It wasn’t as moist as the red beet cake. So I think I’m almost there perfecting the red velvet cake, but you will have to wait. I’m not posting a cake recipe until I’m sure, so there will be a cake number five. In the meantime, use your favorite cake recipe, and create your own pops. Jaden shows flowers. I did hearts just to be sentimental, but they are trickier because of the weight in the wrong place on the stick. But aren’t they cute, and you really don’t need to make them into pops; they are cute just as little cakes. 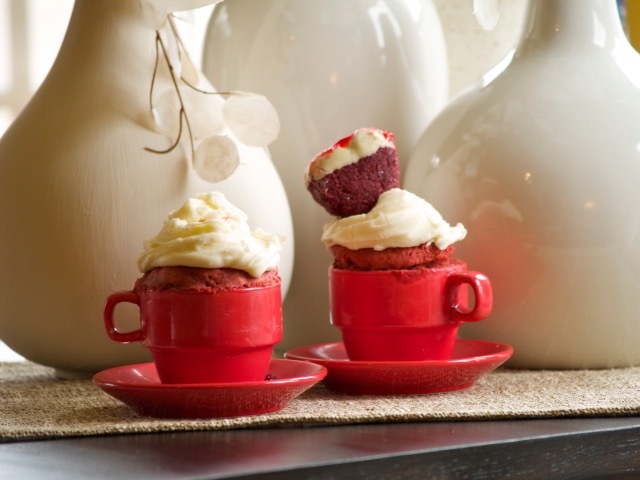 For the cake cups, I simply microwaved for a few minutes, stopping after two minutes to assess and then every 20 seconds, watching the cake the whole time. For Cake Pops: Mix cooled baked cake with cream cheese frosting. Chill in balls that will fit into cookie cutter shapes. When chilled, shape, freeze, dip in white chocolate. Note: I know this is a very brief description, and I promise to return once I have perfected this cake.